If “Things Associated with Dances with Wolves ” were a category on TV's Family Feud , once contestants had already succeeded in rattling off items like director/producer/star Kevin Costner, the name “Stands With a Fist,” and the Civil War setting, most likely one of the surveyed responses would've referenced the sheer length of the seven-time Oscar winning 1990 epic. For although it'd been at least fifteen years since I’d seen Costner's contemporary classic, the film's running time remained first and foremost in my mind, even before I realized that I’d have to add in roughly another hour to that total when I discovered that 55 minutes of additional footage had been woven into Dances for its inaugural Blu-ray release to coincide with the Best Picture winner's 20th Anniversary celebration. Yet despite fearing that “more time” was the last thing that the already deliberately structured epic needed, the extended edition of Dances with Wolves makes Costner’s classically stylized saga feel completely new again. More importantly, this version reminds us that regardless of the fact that everyone agrees that GoodFellas was robbed by Academy voters for the Best Picture statue, the acclaim for Dances is nonetheless justified. And by offering us a definitively intricate narrative with which we can better appreciate all of the subplots and supporting players, the 20th Anniversary cut goes a long way in removing some of the criticisms previously levied at the work with the now far more thorough treatment of its Native American characters. Yet having said this, it’s also important to note that patience is required for viewers to adjust to the notably slower pace of the now 234 minute Dances. For example, it takes roughly an hour in this edition before disillusioned Union soldier turned western frontier adventurer John Dunbar (Costner) even begins to make inroads in his tentative friendship with the equally curious but cautious neighboring Sioux tribe. And while it’s hard to avoid the pitfall of predictable plot-points as well as anachronisms in the language given some liberties taken with humor and dialogue that sounds far more modern than historic, despite its overall brilliance and awe-inspiring execution, Dances remains a well-intentioned but lightly flawed masterpiece. But thankfully for Costner as well as the audience, the missteps are usually hidden by the production's gifted cast and crew. For despite the fact that the otherwise terrific character actress Mary McDonnell is woefully miscast in the role as the recently widowed, white “adopted” Sioux daughter turned Dunbar’s love interest Stands with a Fist, because she appears to be the exact same age as her Native "father" (Graham Greene), luckily her skill as a performer helps make their chemistry believable. Overall, it's an eloquent, polished and cinematically picture-perfect production from John Barry’s renowned musical score to the remarkable way the movie remains intimate and emotionally involving whether two people are together in the frame or hundreds of individuals are in the midst of battle. However, Dances is all the more impressive to behold when you remind yourself that it was Costner’s feature filmmaking debut. Moreover, Costner's passion for the project is impossible to ignore in what ultimately was a long-time labor of love project that had obsessed Costner throughout the ‘80s. After reading Michael Blake’s original unproduced screenplay of Dances with Wolves, Costner advised Blake to flesh out his work by publishing Dances as a novel in the hopes of doubling the man's chances of getting Hollywood to make the movie. And sure enough, once Blake's novel was published, Costner decided to beat the studios to the punch, buying the rights to make the project the right way himself, hiring Blake to adapt his book yet again in what would become an Oscar winning adapted screenplay and also bringing a mutual collaborator, Jim Wilson aboard as producer. In doing so, Costner ignored the dubious press and staggering obstacles involved during production such as shooting in the uncertain Midwestern climate, working with wild animals and collaborating both on and offscreen in a language other than English. Additionally, despite the understandable criticism that once again onscreen, we’re exploring another culture through the eyes of a white man, Dances with Wolves refuses to whitewash over this country’s treatment of the Native American people in a revisionist historical work. As such, it only benefits from the additional footage in giving us a greater vantage point and understanding of some of the supporting Sioux characters like the unforgettable Wind in His Hair (Rodney A. Grant) and Smiles a Lot (Nathan Lee Chasing His Horse). Likewise in taking a decidedly daring view of the Civil War as Dunbar finds his own strength and courage through an act of madness, Costner paints a morally and ethically complicated yet humanistic portrait of individuals struggling to live side by side in a changing society where ignorance and prejudice are far deadlier than weapons because they lead to violence. Cinematically, there's no denying the triumphant achievement of the work which initiated a filmic renaissance of the historical western genre and similarly championed a return to the “cinema as spectacle” epics of grandeur last seen in the David Lean era of the '60s, with subsequent Oscar winning opuses like Unforgiven , Braveheart , Gladiator , Titanic and more. 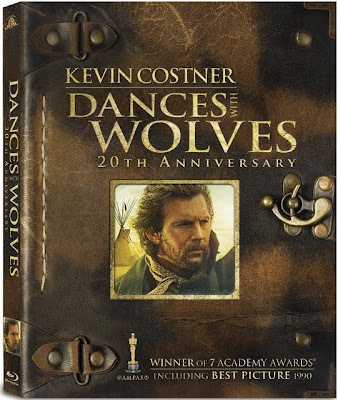 And even though this lush, gorgeously restored Blu-ray edition of Kevin Costner’s Dances with Wolves could fittingly be dubbed "Plays an Extra Hour" as its official Lakota Sioux nation inspired name, the feature in question remains not only as compelling as ever but also ever-so-worthy of another look for viewers that remember little more than its length.